I am not a blogger. This is my first attempt at writing for the world to see, unless you count some whiny and depressed rants posted on DeadJournal nearly a decade ago. So why, you ask, are you starting now? Because I bought a house. 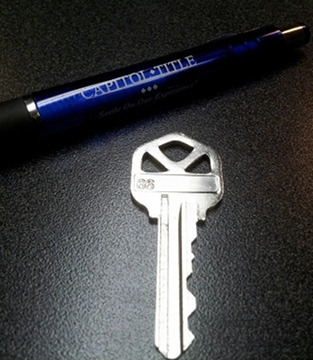 I closed on my first home on October 11, 2013 and amid chaos filled with cardboard boxes and doors that don’t quite close right, I decided that I want to document the changes I will make to this house to make it truly my home. See? I got a key! It’s my house!! Something you must know about me is that I am not your average duckie. I am… eclectic. Actually, I am downright strange, as are my tastes. In some ways, my tastes in decor are biploar; I like simplistic designs, but also have a love for Victorian splendor. I like things to be functional, but I also like them to be pretty. I am going to attempt to incorporate all of this into the updates to my new house to make it reflect all of this, while not being overwhelming. Why so much emphasis on redesigning, you ask? Frankly, the house is charming, but ugly. Every room is painted a different color and so are the ceilings and the colors are just not my thing. 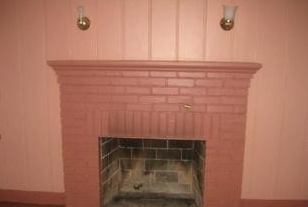 Why would you paint a fireplace and an entire room pink?!! Square footage: 1,260 sq. ft.
Total property size: 7,680 sq. ft.
And it is my job to make it beautiful.